Visit us at Argus Added Value Fertilizers Europe 2019! » News » Corporate news » Visit us at Argus Added Value Fertilizers Europe 2019! 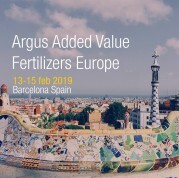 From February 13-15th, Argus Added Value Fertilizers Europe will occur in Barcelona, Spain. The convention will be held at the Hilton Barcelona with the Tradecorp stand. On the 15th at 10:00am, Jose Nolasco, Strategy and Innovation Director at Tradecorp International, will be giving a speech about the role of “Iron Chelates for Preventing Iron Deficiencies and Improving Crop Yields.” The talk will be focused on the key role that Fe plays in the crop nutrition process, strategies for improving plant tolerance against Fe deficiencies, as well as mentioning revolutionary iron chelates. VIP (Value for Industrial Partners) is a new division in Tradecorp with a focus on the B2B segment. It provides adapted technologies and innovative solutions to industrial actors, such as, fertilizer producers, bulk blenders, lime producers and peat substrate producers that are looking for added value and a variation of their products. José Nolasco has been serving Tradecorp’s R&D department since 2008. He holds a bachelor’s degree in Agricultural Engineering from the Polytechnic University of Madrid as well as a master’s degree in Marketing and Business Management. Outside of Tradecorp, he dedicates time as an Associate Professor at the Polytechnic University of Madrid. This conference is dedicated to the European market’s specific crops and products and analyzes the technical, agronomic and commercial facets of fertilizers such as specialty products, enhanced efficiency, and added value fertilizers. Over the span of three days, attendees, alongside delegates, will be able to participate in an array of extensive networking opportunities along with gaining insight on the evolution of this growing sector. One goal of this conference is to bring together the people from the entire fertilizer value chain in order to incorporate knowledge of specialty fertilizer products such as; water solubles, slow and controlled release, foliars, micronutrients, and biostimulants.